The cult of Hastur no longer threatens Thrushmoor, and now the adventurers board a riverboat to Cassomir to track down their obsessed and corrupted former employer. Along the way, they explore the Dreamlands and attempt a number of bizarre dream quests, after which the adventurers can heal their fragmented minds — but they also learn of a greater threat looming over Golarion. Can they survive the perilous Dreamlands and emerge intact or will they be stranded in a dimension of nightmares? 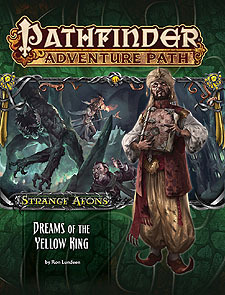 "Dreams of the Yellow King," a Pathfinder adventure for 7th-level characters, by Ron Lundeen. A comprehensive gazetteer exploring the Sellen River, Avistan's most expansive waterway, including additional encounters one could run into while sailing its winding course, by Liz Courts. A collection of terrifying and bizarre monsters, including an enigmatic Great Old One, by James Jacobs and Todd Stewart.